Should not be kept with most invertebrates, particularly soft corals and sponges, which comprise their diet. A good mix of prepared and fresh or frozen food, such as squid and sponge based flake food. 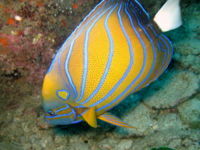 Juveniles have a black body with alternating white, and blue stripes, while adults have an orange or golden brown body with curved horizontal stripes radiating from the pectoral fin area to the posterior portion of the dorsal area. Captive bred specimens are available. They are bred, and reared in land-based saltwater ponds in Bali, Indonesia. This page was last edited on 19 February 2018, at 23:22.